Originally the Santa Fe Terminal Building No. 2, these lofts are listed in the National Register of Historic Places. True loft feel with polished concrete floors. Rooftop pool and deck have incredible views. Had my photographer refresh the common area photos in 2014. Self-storage available on each floor, media center. HOA includes hi-speed Internet. Community contribution fund of 2 months HOA. 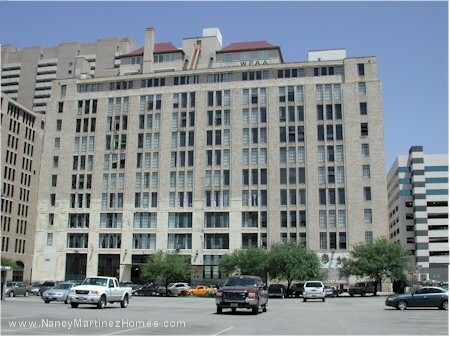 ° Historical loft in the heart of Downtown Dallas! Carefully blending old world industrial architecture with modern design & functionality, the bright & airy open floor plan, high ceilings, polished concrete floors, exposed brick & duct work, updated kitchen, oversized bathroom with garden tub, & floor-to-ceiling windows add a high-end feel to this space! 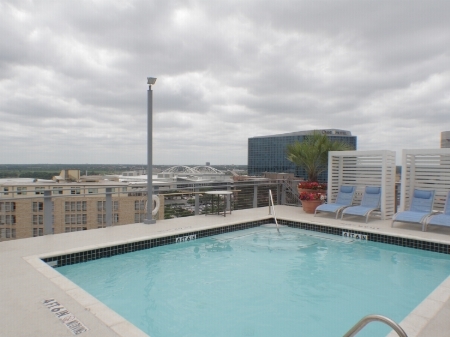 While relaxing in a cabana or grilling out by the rooftop pool, you'll enjoy picturesque views of the Dallas Skyline. 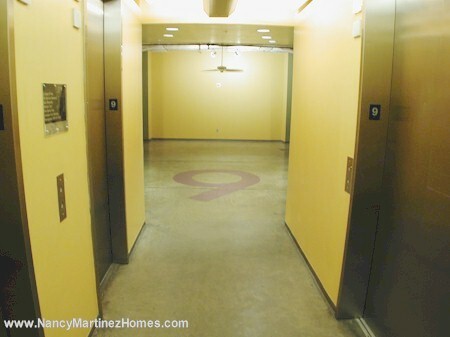 Fitness, yoga, & club rooms, free wifi, storage unit, water & trash, underground parking space included. Walk to Main St Garden, Kylde Warren Park, Arts District, West End, AA Center, endless Fine Dining, Shopping, & Entertainment. Pet Friendly! ° Additional Info: HOA dues are $355 monthly, 1 covered parking space(s), Dallas ISD. 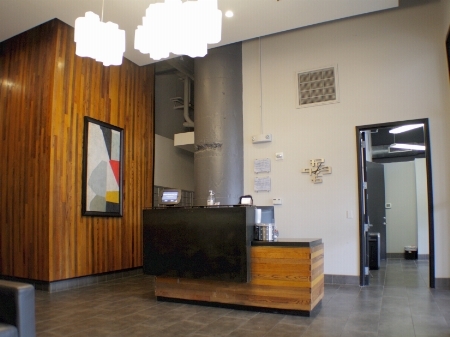 ° Listing Agent: Kimberly Pafford, Century 21 Mike Bowman, Inc.
° Come home to this modern loft in the heart of downtown. 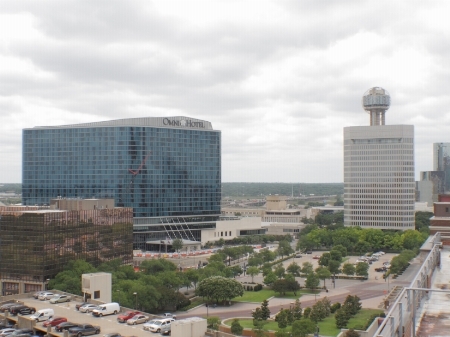 Spectacular views of the Omni hotel and Reunion Tower. Tons of Architectural features including floor to ceiling windows in this open concept with an alcove that can be used as bedroom or study area. Industrial finish out includes concrete floors, exposed brick and ductwork, stainless steel appliances, kitchen island, and washer & dryer connections. Building features include underground assigned parking, Storage unit, fantastic gym with large yoga-dance room, roof top pool with cabanas and grills, front desk security, high speed internet and access to media room. Great location less then a mile from AA Center, Clyde Warren Park, Aquarium, Arts District . ° Additional Info: HOA dues are $405 monthly, 1 covered parking space(s), Dallas ISD. ° Call this modern loft in the heart of downtown-home. Spectacular views of Downtown Dallas all around. Tons of Architectural features including floor to ceiling windows in this open concept. 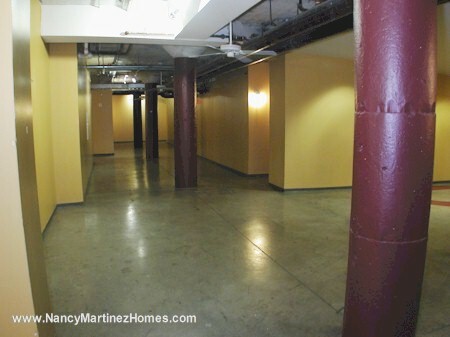 Industrial finish out includes concrete floors, exposed brick and duct work. New paint, stained floor, huge walk in closet, stainless steel appliances, granite counter tops, kitchen island, and washer and dryer connections. 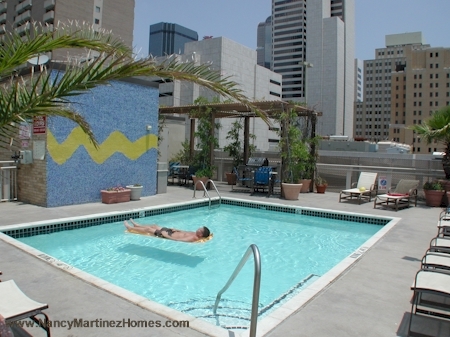 Building amenities include underground assigned covered parking, storage unit, fantastic guy with large yoga-dance room, roof top pool with cabanas and grills. HOA includes 24-hour concierge, internet, blanket insurance, water, trash and access to media room.This building is located close to everything. ° Additional Info: HOA dues are $400 monthly, 1 covered parking space(s), Dallas ISD. ° Beautifully updated loft in the historic Soco Urban Loft building. Exposed ductwork, tall ceilings, and open-concept living spaces provide the true loft experience. Updates include new SS appliances, new LVT flooring, fresh paint throughout, chic lighting, window drapery, a remodeled bathroom, and custom closet systems. Monthly HOA includes high-speed internet, a secured garage space, storage, water, sewer, and trash. Building amenities include concierge service, a fitness center, and a rooftop pool. 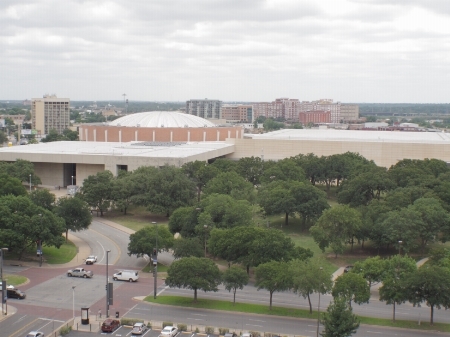 Walk to Klyde Warren Park, AT&T Campus, Pioneer Plaza, Main Street Garden Park, and much more. ° Additional Info: HOA dues are $427 monthly, 1 covered parking space(s), Dallas ISD. ° True loft, high ceilings, open concept, gorgeous design makes this a remarkable space. Vintage building loaded with amenities. Huge walk in closet with washer dryer hookups, XL bathroom with garden tub. Large windows and custom lighting. Upgraded kitchen with SS appliances and granite countertops. HOA includes water, trash, sewer and high speed internet. Covered parking space and storage unit are included. ° Additional Info: HOA dues are $450 monthly, 1 covered parking space(s), Dallas ISD. 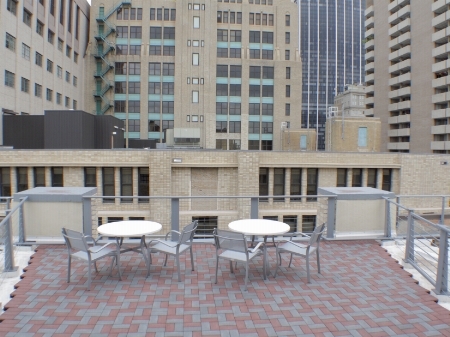 ° Must see LOFT in the heart of downtown Dallas. Graciously proportioned living room-media room, over sized windows, charming exposed brick makes this the perfect home. Kitchen includes incredible counter space, granite counter tops, ss appliances. Upgraded bathroom with beautiful tile work and new sink. New paint throughout the loft. Separate laundry space. Building amenities include roof top pool, fitness center and guarded entrance. Unit comes with assigned parking space and storage unit. 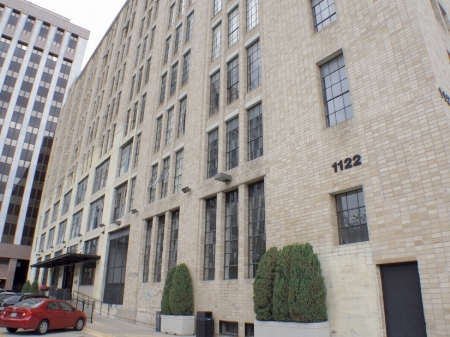 ° Located in the heart of downtown Dallas in the Historic Santa Fe Railroad terminal building, this industrial style loft with concrete floors and exposed brick and ductwork gives you the sleek modern look and feel of urban living at its finest. This spacious unit features extraordinary downtown views and an abundance of natural light streaming into through a wall of huge floor to ceiling windows. The kitchen features upgraded custom cabinetry with stainless appliances, and granite countertops. Amenities include fitness center, rooftop pool with panoramic views of downtown, 24-hour concierge, storage unit and garage parking. Located minutes from ATT campus and Pioneer Plaza Park! HOA includes High Speed Internet. ° Additional Info: HOA dues are $481 annualy, 1 covered parking space(s), Dallas ISD. The following units are listed for lease in SoCo Urban Lofts as of April 13, 2019. ** Note that landlords may have more restrictive limits on pets than indicated above.